The Row is a tablet designer case sporting a very minimalist design. Handmade entirely out of 100% genuine calfskin leather , the case not only offers stunning looks, but can protect the tablet from everyday minor bumps and bruises. Compatible with any Apple tablet including the iPad, iPad 2, and the new iPad. The interior of the new iPad case is lined with ultra-soft suede material, which guarantees the device always stays in pristine condition and is highly prone to smudges and scratches. The Apple iPad 2 case can be completely shut thanks to a high-quality zippered closure, which keeps the contents within the case at all times. 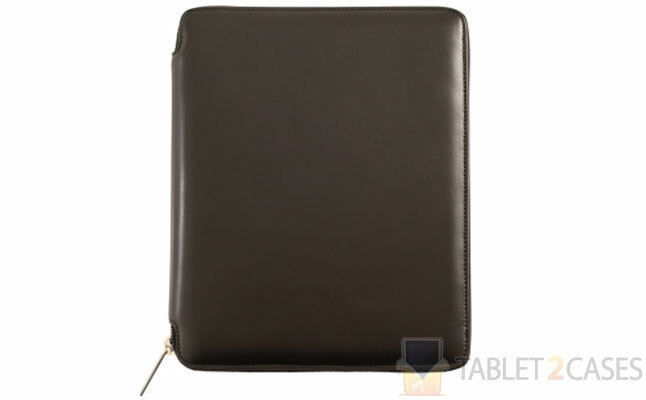 The silent black color of the Apple iPad case makes it equally suitable for business and leisure. The minimalist design allows the Row to serve equally well as a case for men and as a case for women . The price for this case is $1,900.